This week’s lesson looks at six stories in which Jesus ministered to gentiles, and the author makes the point that these events demonstrated Jesus’ example of cross-cultural ministry and mission. 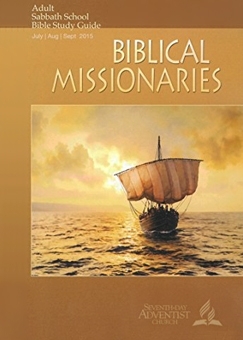 To be sure, Jesus did prepare His disciples for carrying the gospel to the gentiles, but to diminish the significance of Jesus’ ministry to a demonstration of a modern concept, “Cross-cultural Missions”, is to use the Bible to support an agenda rather than to derive eternal truth from the living word of God. First, “cross-cultural mission” was always God’s intention. He is the One who created the nations by judging the disobedient people at Babel by confounding their languages, thus causing them actually to fulfill His command: scatter throughout the earth and fill it. When they disobeyed by refusing to scatter and attempting to establish a name for themselves by building the infamous Tower of Babel, God judged them. He made it impossible for them to collaborate together any longer, and they gathered themselves into language groups and spread themselves by languages throughout the world. God Himself created the nations through His act of judgment on the disobedient people on the plain of Shinar. When God gave His Spirit to believers at Pentecost, He reversed the curse of Babel for those who trusted Jesus. God gave them the indwelling Holy Spirit who would never leave them, who enabled them to speak the gospel in languages others could understand, who empowered them with boldness and spiritual insight and with the ability to explain Scripture to show how Jesus fulfilled the law, the prophets, and the Psalms. The gift of the Holy Spirit as the seal of the new birth and as the sign of the new covenant circumcision of the heart is the reality that reverses the cultural resistance to the gospel of the Lord Jesus. No matter how clever humans are with contextualizing Scripture so other cultures will understand it, those plans will never work without the intervention of the Holy Spirit both opening the hearts of the hearers and giving the words and wisdom of God to those witnessing of Him. This lesson fails to understand the central reality of humankind: the issue is not cultural differences; the issue is two kingdoms: the domain of darkness where Satan is the prince, and the kingdom of the Beloved Son where those who are born again have been transferred (Col. 1:13). If a corporation wishes to sell its product and its marketing concepts to a different culture, “contextualization” would be necessary. But this idea of contextualization, of trying to figure out what is important to share and what isn’t and how to share it, is largely a fleshly pursuit, not a biblical one. Of course one must be sensitive. Of course one must love those one wishes to lead to Christ. But “loving” and “friendship evangelism” are not methods. If these things are taught and endorsed as methods, the reality of being born again and filled with God’s own love and Spirit are not being understood. Once again, this lesson attempts to understand mission work without first understanding the true gospel and the biblical new birth. Adventism is not the biblical gospel, and Adventists will be no more effective at “evangelizing” than will any Mormon, Jehovah’s Witness, or prosperity-gospel purveyor because Adventism is simply a product. It is a human idea, a false gospel with particular requirements that make it unique. It is not biblical Christianity. Because it is not biblical Christianity, Adventism cannot expect to have the Holy Spirit’s power behind its proclamation. God will not lend His power and enablement to spread what Galatians identifies “another gospel, which is no gospel at all” (Gal. 1:6). Consequently, Adventists’ best bet for success is to humanly plan for ways to “contextualize” its message. If those writing the lesson were able to admit that Adventism is a “package” unique from all other religious packages, they could talk about cross-cultural missions as a business plan—which is exactly what this notion is. It must be admitted, however, that many Christian organizations also use these egalitarian ideas of contextualization and cross-cultural palatability, but that fact simply means that the biblical reality of hard work, of life-long commitment to the pure gospel of the Lord Jesus’ death, burial, and resurrection, of commitment to the people to whom God sends them means that God will give them wisdom to be able to explain the gospel in ways those people will understand—these biblical ideas have been eclipsed and abandoned in favor of more modern, inclusive methods. These methods are simply man-made marketing techniques, not biblical evangelism. The stories the lesson uses as examples are profound moments in Jesus’ ministry that reveal His identity and the nature of His gospel. The Samaritan woman at the well, for example, is not an example of cross-cultural missions. Jesus boldly went and talked to this woman, revealing who He was and teaching her some of the most profound theological truths He told, to a Samaritan woman who observed a syncretistic religion of Jewish and Canaanite practices inherited from the half-breed legacy of the apostate northern kingdom of Israel. In this short passage Jesus declares that true worship is not about sacred place or time or practice. Rather, it is about truth—immovable, biblical truth—and about spirit. True worship is not mental assent to a set of beliefs; it is performed both with the mind in recognition of truth, and in one’s literal spirit when the Holy Spirit makes our spirits alive. God, He said, “is spirit”. Therefore, we must worship in spirit and in truth. Jesus knew the heresies that would creep into the church. He knew the heresy of the physicality of man that groups such as Adventists and Jehovah’s Witnesses would believe, and He told this woman, this “unclean” Samaritan woman, one of the most profound realities that we would need to know: we have spirits that worship God. In fact, if our spirits (which are not our breath or life force) are not engaged in truthful worship of the one true God, we are not truly worshiping. Moreover, Jesus’ witnessing to this woman and that village’s subsequent invitation to Him to spend three days with them prepared the Samaritans to receive the Holy Spirit after Phillip preached to them in Acts 8. They were the “second wave” of Pentecost as God ushered the Samaritans into His church in exactly the order Jesus told His disciples to witness: beginning in Jerusalem, then Judea, Samaria, and the uttermost parts of the earth (Acts 1:8). To be sure, Jesus intentionally went to the Samaritans and spoke to this woman, but He did not contextualize the gospel for her. He addressed her own beliefs and questions, and He clearly identified Himself to her as the Messiah. She knew He was coming, even though her religion was confusion—but God had given her an open heart, and she knew the Messiah would come. Jesus simply went in and revealed the truth to her. He didn’t mince words or try to make himself culturally relevant. In fact, He was a bit offensive! But He spoke the truth, and she believed. It wasn’t contextualization that convinced her; the Holy Spirit convicted her of the truth of Jesus’ words. The Roman centurion discussed on Monday was not being kept from Jesus because he was Roman and Jesus was a Jew. The lesson attempts to frame this story as an example of Jesus and the centurion being sensitive to one another’s customs in an effort to get this man’s servant healed. On the contrary, this story demonstrates that true faith is culturally neutral. Jesus clearly articulated that this Roman centurion had faith greater than any he had seen in Israel. He further stated that at the feast in His kingdom, “the sons of the kingdom will be thrown into the outer darkness.” He was clearly stating that the Jews were hardening their hearts against the fulfillment of the very Scriptures which they knew and taught, and those children of the kingdom would not enjoy the kingdom, but gentiles would be there with the patriarchs. The point Jesus was making was not that with proper cultural sensitivity the gentiles could also believe. Rather, His point was that hardness of heart was not due to cultural barriers. Those with the advantages had the hard hearts; the centurion, who had no Jewish advantage, had faith that only God could produce, and he believed what he saw of Jesus. He did not believe Jesus because Jesus made believe culturally relevant to him. He believed because he understood that what Jesus was doing was what only God could do. That realization had nothing to do with contextualization. Tuesday’s lesson deals with the story of the demoniac of the Gadarenes and with the daughter of the Canaanite woman who was possessed by demons. In both cases, Jesus sent the demons away, and in so doing, He had new witnesses of Him who would tell of His power over the demons to their own superstitious and demon-worshiping countrymen. Jesus was not just saying the gospel was for gentiles, too. He was actively revealing His true identity to those who had no background in the law or the prophets, but He was confirming that He was God and had power over the forces that controlled their lives. He, not the demons, had the last word and the ultimate power. And in setting these people free, He established believing witnesses among the gentiles. Jesus was preparing the way for the work His apostles would do after His ascension. Wednesday’s lesson about the ten lepers is interesting and is often told within Adventism as an example of proper thankfulness. To be sure, thankfulness is part of the story. Nevertheless, there is more to it. As the lesson points out, the nine who did not return did go to the priests as Jesus told them to go. They were undoubtedly Jews, and what Jesus told them to do was what the law demanded when someone was healed from leprosy. The one who returned was a Samaritan. It is possible that the priests would not even have allowed him to enter the temple to go through the ritual cleansing because he was not a Jew. Nevertheless, he believed in Jesus when he realized he had been healed. His thankfulness was not just thankfulness for healing; it was worship. He praised God with a loud voice and threw himself at Jesus’ feet, giving Him thanks. He truly believed; he was not just happy to be well. Then Jesus answered, “Were not ten cleansed? Where are the nine? Was no one found to return and give praise to God except this foreigner?” And he said to him, “Rise and go your way; your faith has made you well.” (Luke 17:17-19). Jesus commended this man for praising God, not for thanking Him for healing. This man recognized who God is and that He alone was worthy of worship. This was the core of the miracle of the lepers. One—the one least likely to have understood and known God—saw and believed. All ten were healed; one praised God. Thursday’s story is of the Greeks who asked Philip, who was from a section of Galilee where there was a large gentile population, to see Jesus. The lesson tries to make this about nationals having an easier time witnessing to their own kind. Again, this point is not remotely the point of the story. These Greeks were God-fearers, gentile men who believed in the true God and had come to Jerusalem to worship at the Jewish festival. They recognized Jesus as having the power of God, and they wanted to see Him because they were compelled by what they saw and heard. No, this lesson misses the entire point of the Bible passages it quotes. The gospel is not better served by cross-cultural methods and contextualization. True mission work is witnessing of the Lord Jesus, of His death, burial and resurrection. It is not an attempt to convert people to a paradigm or method of belief. It is introducing people to the One whom to believe is to have Life. Contextualization is essentially a human invention designed to make people come around to one’s viewpoint. Christianity, however, is not a viewpoint nor a system of belief. It is a new reality, a transfer from the domain of darkness into the kingdom of the Beloved Son (Col 1:13). For more reading on the issue of contextualization of the gospel, see this article in a past issue of Proclamation: "Contextualization: What former Adventists don't need". Copyright 2015 BibleStudiesForAdventists.com. All rights reserved. Revised August 12, 2015. This website is published by Life Assurance Ministries, Camp Verde, Arizona, USA, the publisher of Proclamation! Magazine. Contact email: BibleStudiesForAdventists@gmail.com.